Cracker thins. Crisp bread. Cracker crisp. These have been the new thing to hit the supermarkets since the summer and I can’t stop munching on them. Perfect with houmous, cheese, dips, or just general munching, I couldn’t believe how easy it was to actually make your own cracker thins! Like seriously, this couldn’t be any easier. I discovered the homemade cracker thins by complete accident, which never happens. But it did. So here you go. It’s ok, you can thank me later. Slice your wrap up into 1inch strips, then cut these in half. Pop them onto a baking tray and into the oven at 200°C for 5 minutes, or until the edges start to go golden brown. Whip them out and serve. See? I told you it was easy! 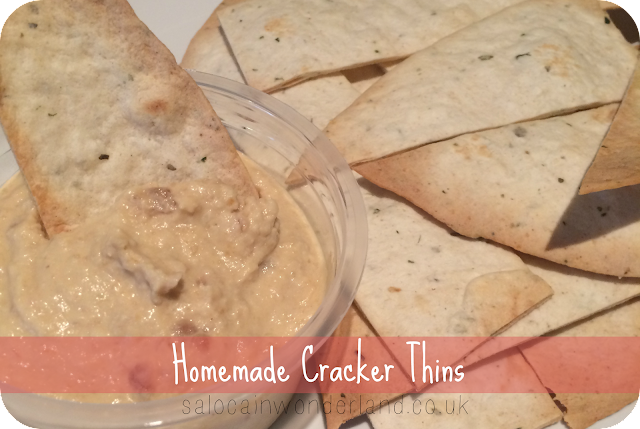 I love using Mediterranean herb wraps but making these with sweet chilli wraps make some seriously tasty cracker thins too. If you only have plain wraps to hand, season them with a little sea salt and cracked black pepper or a sprinkling of chilli flakes. The possibilities are endless! Quick, easy and a cheap alternative to the store bought ones. You can thank me now, go on, you’re welcome. Ohhh I didn't know you could make crackers like this. I thought this was going to be home made Christmas crackers at first haah! They taste SO good, I was really surprised, I also like using the wraps as pizza-style bases!